When we talk about hybrid or electricity powered vehicles, immediately we think about cars, seldom we think about the trucks and any other vehicle. The people who really matter in the automobile industry are of the opinion that converting trucks into the greener vehicles will have a great impact on the environment. More eco-friendly trucks on the road means, the cheaper eco-friendly cars will be in more demand. The United States based company Peterbilt has a great contribution to green medium and heavy duty trucks. The company has won many awards for its contribution to manufacture clean, fuel- efficient long haul vehicles. The company has great reputation on its technology which is based on the alternative fuels like compressed gas be it LNG or CNG. The company has a unique strategy when it comes to alternative fuels and its approach is totally based on environment friendly initiative. 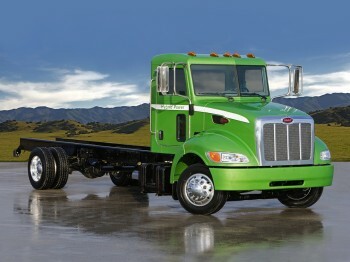 Peterbilt has a strong belief in recycling the material and is very conscious about the energy conservation. It has been continuously developing new technology like fuel cell and electrically powered systems, waste heat recovery and ultra-capacitor starting modules. The Environment Protection Agency (EPA) has given recognitions to Peterbilt in their Smart-Way program which sets certain green specification for class 8 long-haul tractors and trailers. The vehicles manufactured by the company has been deemed Smart-Way compliant which are 10 to 20 percent fuel efficient than the fossil fuel powered trucks, and the carbon and other emissions are less. Eaton is another company which has a wide range of industrial products, though the company does not manufacture trucks but it manufactures hybrid power system that makes the trucks more environmentally friendly. The company has success record of many launches among this is the recent hybrid power technology which has been used by Mercedes-Benz Blue Atego Hybrid. This was instant hit at the international motor show in Hanover. Mercedes–Benz Blue Atego range was named 2011 truck of the year and this has paved the way for alternative drive systems. The fuel consumption and the emissions are reduced by almost 15% and this was the first truck to be approved by Europe. It has proved very useful to farmers, towing companies, construction people and is also a great family vehicle. The fuel saving technology feature include use of 18 inch wheel to reduce weight and has better aerodynamics. The other alternative fuel pick up the Chevrolet Silverado E85 and Ford F-150 E85 which run on 85% blend of ethanol, which is derived from corns and is a renewable energy source. The benefits of E85 fuel also have a torque and horsepower and the reduced greenhouse gases. The real only fuel efficient light weight electric truck on the roads in America, the Ford Transit Connect Electric. It is a delivery style vehicle and has been given the title of truck of the year. It is quite suitable to be used in the commercial fleets and can be used for short distance travel in the cities where there is the facility of recharge in the centre. With the growing awareness about the environment, the future for such green vehicles is quite bright.